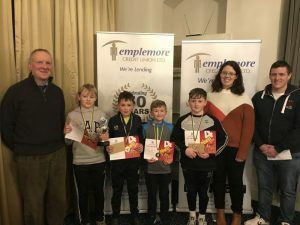 Congratulations to our U-11 and U-13 Credit Union quiz teams who represented themselves so well in the Templemore Arms on the 1st February 2019. 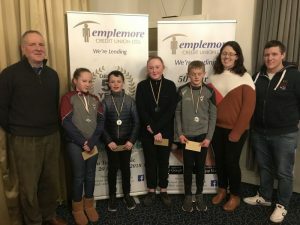 We had fantastic success in both categories with the U-13 team placing second in their category, while the U-11 team took top spot in their category. The U-11 now progress to the next round (chapter level) of the Credit Union Quiz which will be held on the weekend of the 1st-3rd of March. Patrick, Jack, Michael and Cathal represented the school in the U-11 section, while Lisa, Conor, Tara and Tom made up the U-13 team. We are immensely proud of all these wonderfully talented children. Lots of practice in store for the children over the coming weeks in preparation for the next round!